The cover of Reverse of the Medal differs from other Geoff Hunt covers in that it is primarily land-based, it does not portray any scene from the book, and it is not entirely original. Hunt acknowledges that he has based the composition upon the early 19th century illustration 'Portsmouth Point' by Thomas Rowlandson. 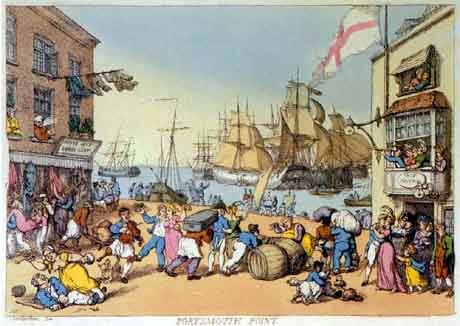 Both are street scenes of Portsmouth, with ships in the background and the Ship Tavern prominent on the right. Hunt's version is more sedate than Rowlandson's raucous scene. The view is to the west towards Gosport across the water. A 74 gun third rate under topsails is taking advantage of a fair northerly breeze to put out to sea. In the distance another ship, perhaps a frigate, is beating its way toward the harbor entrance, close-hauled on the larboard tack. Pulled up the hard is a ketch-rigged vessel with lee boards, probably an English fishing smack with ochre sails. An admiral's barge carrying a full Admiral of the White is pulling for some ship unseen. Hanging over the entrance to the Ship Tavern is an unusual lamp. Hunt copied it from Rowlandson, not quite sure what type of lighting it was. O'Brian later identified it as likely a new Argand lamp, in use before gas lighting became widespread. The uniforms suggest that it is a few years before the 1813 period of the book. Two lieutenants stand in the doorway. On the floor above, a senior post captain in dress uniform is dining in the window alcove. Out on the hard, an old-fashioned admiral wearing his hat athwartships is strolling with a lady. A different type of lady, one of the infamous 'Portsmouth brutes' in a red dress, is exchanging glances with a blue jacketed sailor. Perhaps they hit it off. 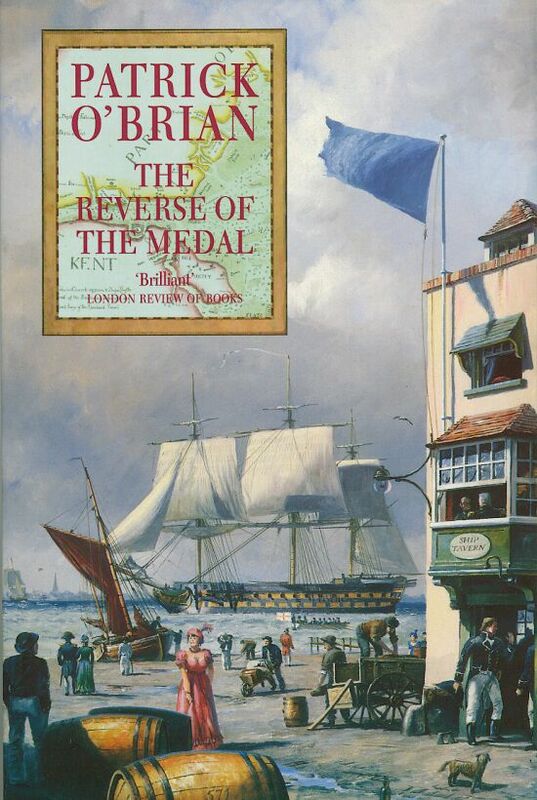 Another Hunt cover, for Brian Lavery's Nelson's Navy, has a similar Portsmouth scene just a few streets away near the gates to the Royal Navy Dockyard. Two figures can be seen strolling in the distance, one a blue jacketed sailor and the other a woman in a red dress and feathered hat. The Log of the "Leopard"